Stay centrally in Asker, within walking distance of the airport express train and a short train ride away from Oslo city centre. With a conference capacity for up to 300 participants, we tailor conference packages and offer flexible solutions for both small meetings and larger conferences. 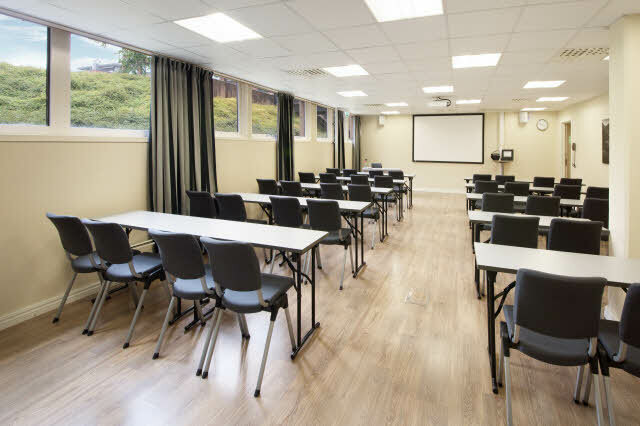 We offer 12 meeting rooms with a capacity for up to 300 people. Enjoy a delicious dinner at our hotel restaurant, or relax in our bar. We also have a restaurant on the 2nd floor, which is perfect for events and private parties of up to 170 guests. We have our own bar with a great sound system and a terrace with barbeque in the summer. Our hotel also offers a modern, well-equipped gym and free WiFi for all our hotel guests. Our hotel is located centrally in Asker, close to shops, restaurants and enjoyable outdoor areas. When you stay at Scandic Asker, you can visit the Asker culture house, and in the summer you can go to Hvalstrand beach or spend the day at Asker Golfklubb. Our hotel is located only 4 minutes away from the train station. Oslo city centre is 25 minutes away and the train ride to Oslo Airport Gardermoen takes 50 minutes. We offer a modern conference experience for up to 300 participants. We tailor conference packages for groups. Our hotel is located 18 minutes from Oslo by train, and is within walking distance of the airport express train. We have 70 indoor parking spaces for visitors arriving by car.